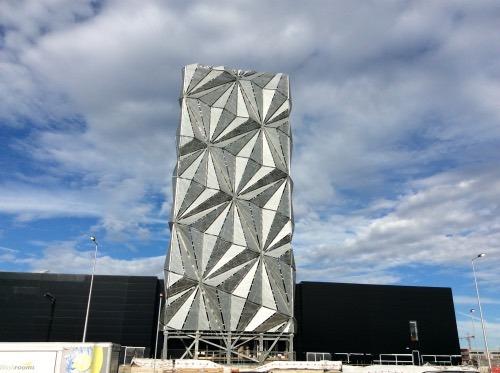 The Optic Cloak is a new landmark on the Greenwich Peninsula. It can be seen from the Thames Path but at present the temporary diversion along Tunnel Avenue allows for a closer view. The tall artwork, by Conrad Shawcross, is camouflage for the soaring flues of an energy centre providing low-carbon energy to homes on the Peninsula.